Yahoo! mail Signatures that work for you! Easily add your social services Facebook, Ebay, Twitter, LinkedIn, IM Services and many more..
Use multiple Yahoo signatures for your business, easy to use with lots of add-ons. How To Create Email Signature On Yahoo? 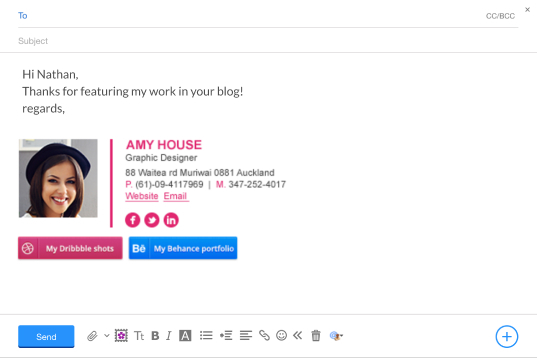 How To Add Social Media Icons To Yahoo Email Signature? Enjoy your new Social media rich Yahoo Mail Signature! How To Change Signature In Yahoo Mail? Click your Yahoo! Mail account. Select Append a signature to the emails you send. Enter or edit your signature text in the Signature field.